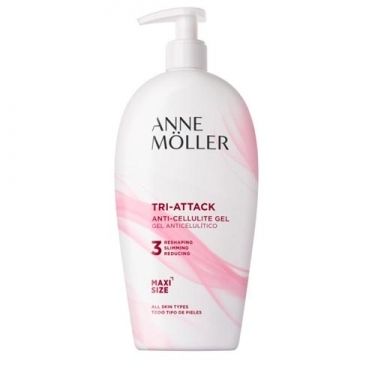 DESCRIPTION: Tri-Attack Anti-Cellulite Gel from Anne Möller is a multifunctional anti-cellulite gel that helps reduce the "orange peel" texture, reshapes the silhouette and contours. Its revolutionary formula combines caffeine with a phytocomplex obtained from the carnivorous plant (sundew) to reduce fat accumulation, stimulate movement and dissolution. A complete plan that, in addition to preventing and fighting cellulite, contributes to improve the elasticity and firmness of the skin. Gel with fresh effect, odor with pleasant intensity and texture of fast absorption. Thighs. Perform an upward massage from the knee to the thigh with circular and vigorous movements. Buttocks. Apply from the buttocks to the waist with circular movements. Abdomen. For the first few minutes, apply clockwise and then counter clockwise. Arms. Perform an upward massage from the elbow to the shoulder.